Gulfport Vice Mayor Christine Brown, left, and Gabber reporter Debbie Wolfe showcase some of the key hurricane supply items they include in their personal readiness kits. Items pictured are: bottled water; a hand-crank or battery powered AM/FM, short-wave radio; high-impact power tool safety goggles that fit over prescription glasses; a baseball batting helmet to protect your head from flying objects; a battery-powered portable table-top fan; a hands-free, weather resistant LED headlamp; a camera to document belongings in advance of a storm for insurance purposes; gloves to protect your hands from sharp objects during cleanup; a high-end portable power cord and multi-outlet box with a reset button. June 1 is the official start of the 2018 hurricane season and we’ve already had one named storm brush by Florida’s west coast. Storm season is serious business, and this year the Gabber is talking to Gulfport’s Vice Mayor Christine Brown about what to do to get you and your household ready. Why? Brown’s personal expertise with hurricanes includes her long-time volunteer efforts with the city’s Community Emergency Response Team, her direct involvement with citizen and pet evacuation efforts during Hurricane Irma in 2017 and teaming up with her husband to build a stormproof safe room as part of their home. Brown and I recently sat down to compare storm survival tips to share with you. What do the two of us include in our personal hurricane kits and why? Here are some key examples that may help you fine-tune your own choices. Grab your favorite beverage and take note. Create a two-part survival plan in advance of a storm: One is for staying home and the other is for evacuation. Plan ahead rather than at the last minute when you are under stress. Use a high-quality camera to document your belongings and home before and after a storm for maximum reimbursement from insurance companies. Make sure cherished belongings are organized for evacuation and can fit in your vehicle. To save your cell phone power, rather than using an electronic GPS, use current paper maps of your city, county, state and region. “Identify a friend who lives on high ground in the Tyrone or Disston Ridge area of Pinellas County who will let you evacuate to their home with your pets,” said Brown. “You don’t have to go to Orlando. Public shelters are terrible for pets” because the animals cannot be loose. At pet-friendly shelters, animals must stay in their carriers and crates for the duration of their stay without bathroom walks or access to litter boxes. Shelters also require documentation to prove pet vaccinations are current. Stock up two weeks of clothing, water, medicine and non-perishable food: Gather comfortable clothing you can wear when it’s hot and muggy. To save money, fill reusable plastic bags with potable water from your sink tap for the bulk of what you’ll need during and after a storm. Fill personal sized plastic water bottles half way and freeze them for two reasons: First, to prolong the life of your frozen food if the power goes out and second, to have access to refreshing cold water for yourself and your pets. In addition to prescription medications, stock up on over-the-counter remedies that address pain, heartburn and indigestion issues because you may be living out of your normal routine and be under stress for a while. Plan for all dietary needs for yourself and your pets. Consider foods that can be consumed cold and test them in advance to make sure you can eat them for an extended period of time. Canned green beans and peanut butter can get boring after a day or two. Have a manual can opener handy. Power bars full of seeds can trigger temporary yet painful diverticulitis. Include favorite comfort food snacks that you can look forward to. “Pinellas County is on a peninsula and it will be one of the last places where essential emergency supplies are delivered to from statewide stockpiles after a storm,” said Brown. Storm survival gear: For light, get a hands-free, weather resistant LED headlamp you can wear on your head instead of wrestling with a flashlight. These are also safer than candles and won’t heat up your living space. A hand-crank or battery-powered short-wave radio will allow you to monitor news from outside the storm area if traditional local sources are unavailable. If you can afford it, get a hand-held, battery-operated marine radio so you can have access to NOAA weather radio broadcasts in addition to two-way communication capability with boaters and first responders that is not phone-dependent. A battery-powered portable tabletop fan will make life without air conditioning more bearable. A high-end portable power cord and multi-outlet box with a reset button will protect your appliances and personal electronics from being damaged from electrical surges. Either get your own generator or save money by teaming up with neighbors. Practice using it safely before a storm and make sure that you have an adequate supply of fresh fuel and oil for two weeks. Know the location of first-responder public gas stations that will be re-supplied first after a storm. For a primitive toilet that is not dependent on a municipal sewer system, you can use a five-gallon bucket. Have a two-week supply of disposable plastic bags handy. In an emergency during a power outage when calling 911 is not an option, use a waterproof whistle or portable boat horn to sound three short blasts – this is an international emergency signal for help. If you depend on glasses to see, make sure you have a spare pair even if the prescription is not current. Have cash available in the form of pocket change and small bills no larger than 20s so you can buy things during a power outage when cash registers won’t be working and making change will be difficult. Create an emergency fix-it kit that includes zip ties, duct tape, small rope and battery-powered tools you’ll need to maintain things like hurricane awnings and shutters. A comfy portable bag chair that you can use to sleep outdoors in is handy. Personal protection items: Bug spray will keep you comfortable. Obtain high-impact power tool safety goggles that can fit over prescription glasses to guard against eye injuries from flying objects in high winds. Consider getting a baseball batting helmet like what the TV Weather Channel’s Jim Cantore used when he was reporting outside during Hurricane Irma in 2017. You may not be a weather journalist – but you may need to go outside during the storm. For clean up after the storm, use work gloves to protect yourself from injury while handling sharp objects; add plastic glove liners to provide some shielding against biological hazards, and wear steel-toed and steel-shanked rainproof footwear to keep your feet safe from nails and dry from standing water. Waterless shampoo, hand cleaner and diaper wipes will mean you will not need to use potable water for personal cleaning. Create a comprehensive, portable first aid kit containing adhesive bandages, gauze, alcohol wipes, antibiotic cream, plastic gloves and more to match your own medical needs. Take it with you if you evacuate. Remember that favorite beverage we suggested you enjoy while reading this? For us, it’s caffeinated coffee. This is why we brew plenty in advance and store it in portioned containers in a refrigerator. If needed during a power outage, we can enjoy it cold or at room temperature and we avoid enduring the caffeine-related headaches that we would get if we had to go without! There are plenty of quality resources to help you get organized to be safe and to have a deeper understanding of weather-related hazards, including Gulfport’s annual hurricane seminar that will be Thursday, May 31 at 7 p.m. in the Hickman Theater. We have also included three more select government-related resources. All inclusive: The 16-page Pinellas County All Hazards Preparedness Guide for 2018 includes a detailed map of evacuation zones and routes and it is available in the following languages: English, Spanish and Vietnamese. To find electronic versions of all three, visit pinellascounty.org/emergency/allhazardguide.htm. 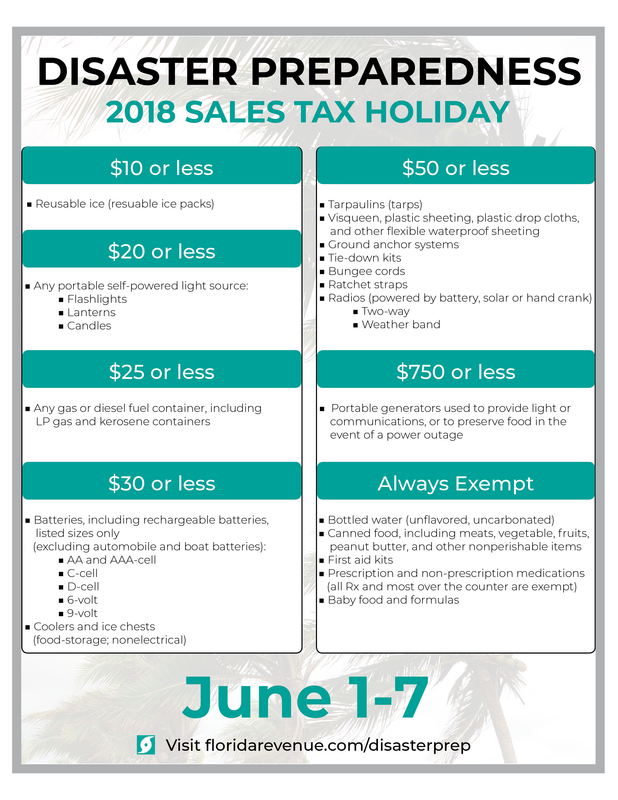 Save money: The 2018 Florida Disaster Preparedness Sales Tax Holiday is from Friday, June 1 through Thursday, June 7. In addition to batteries, check out what other hurricane-related supplies are exempt from sales tax: floridarevenue.com/DisasterPrep/PublishingImages/DP%20Poster.png. Know which areas will flood: Pinellas County Flood Information is an interactive online map that allows you to research flood risk by street address: pinellas-egis.maps.arcgis.com/apps/MapSeries/index.html?appid=5fa37e98d1bb4ffaafc8e164c04e191c.